I've been wanting to go to Blackbird for some time and I noticed that they usually participate in Restaurant Week so I figured I'd try to get a reservation that way. They are one of the first restaurants to completely fill up so you really have to get an early start if you want to try to get reservations there. I haven't been able to get reservations the last few times I tried, so when I heard that they were participating in Chef's Week this year, that was the first reservation I made and I didn't even consult my friends. I just booked it. What I liked about their Chef's Week options was that they offered items from their actual menu as part of the three course meal. Often times chefs will create a whole other menu just for Restaurant Week or Chef's Week, which is nice I'm sure for people who frequent the place often and want to try something new, but for me, since I've never been, it was nice to get an accurate picture of what their regular menu items are like. I have to say, that the meal at Blackbird was better than I expected and it may very well be one of my favorite restaurants in Chicago so far. 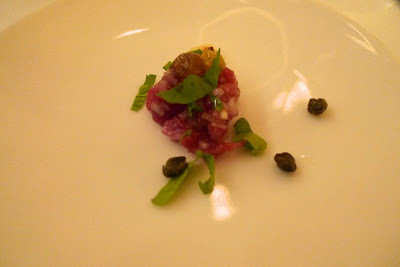 We started with an amuse bouche of lamb tartare with white asparagus. I'm not a fan of lamb, but this was delicious, definitely left me wanting a plate full. For our appetizer we had a choice between garbanzo bean soup with falafel, warm sepia noodles and endive salad with poached egg. Susan and Gook choose the warm sepia noodles, which is basically squid cut to look like noodles. 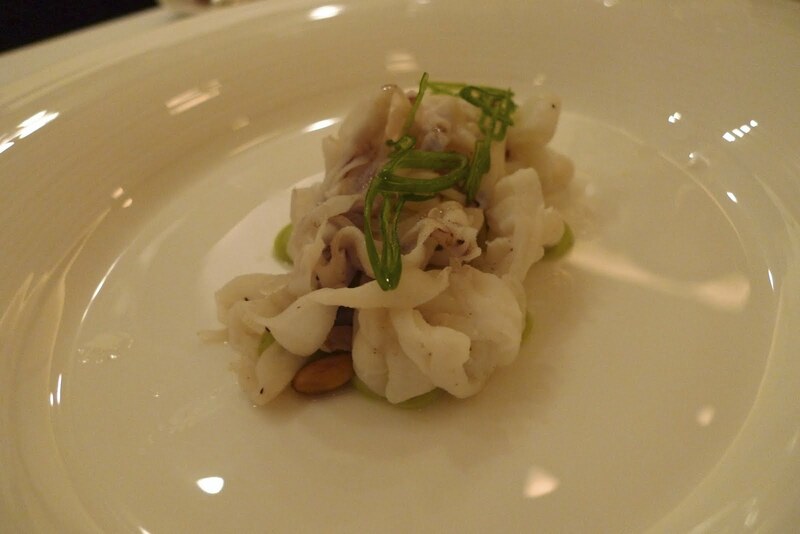 It came with spring onion, avocado, green pumpkin seeds and lime. Aleen and I, being huge fans of poached eggs, got the salad of endives with baby lettuces, potato, basil, dijon, pancetta and poached egg. 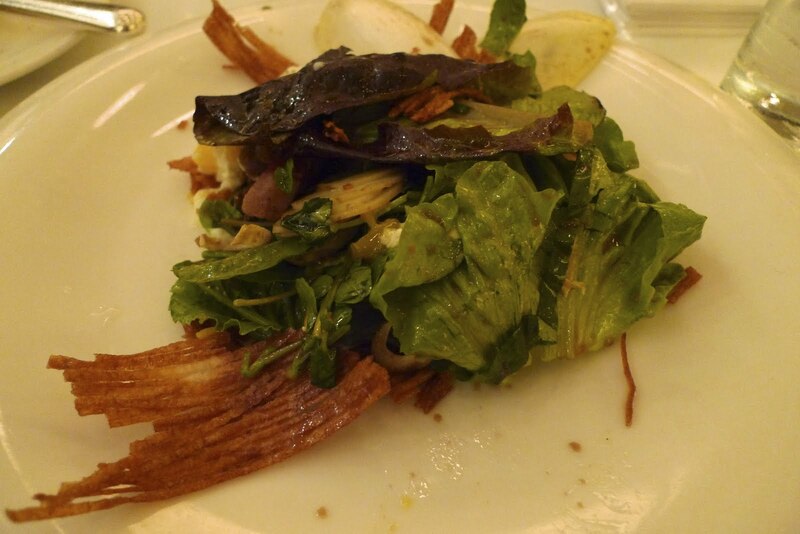 The fun part is that the salad comes in this crispy potato ring and after the set the plate down for you, the waiter will cut the ring into pieces. 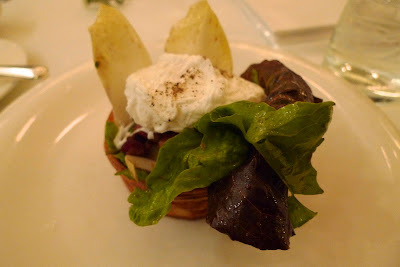 I may be biased because I loved poached eggs in general, but I loved this salad. For our entree, we had three options as well: tasmanian trout, chicken and sausage and a ricotta and butternut tart. 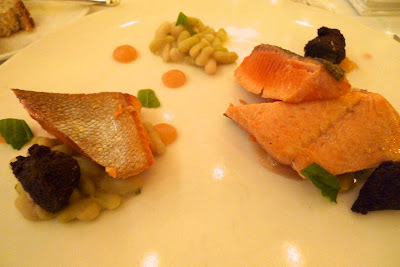 Gook and I chose the tasmanian trout with flageolets, pink lady apple sauce, fried pumpernickel, which tasted like falafel and winter herbs. I loved my dish, I loved that it was cooked medium rare and I loved the contrast of flavors and textures. 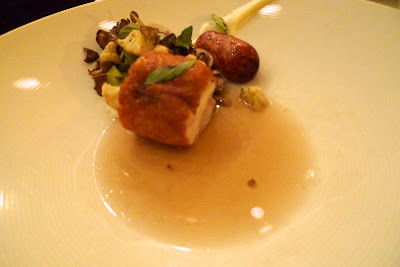 Susan and Aleen ordered the roasted farm chicken and sausage with cauliflower, maitake mushrooms, kaffir lime and applewood broth. Dessert was vanilla parfait with satsuma, campari and almond. We ordered two of each and shared. Gook had the misfortune of being paired up with me. He and Susan got into a heated debate about something and what did I do in the meantime? 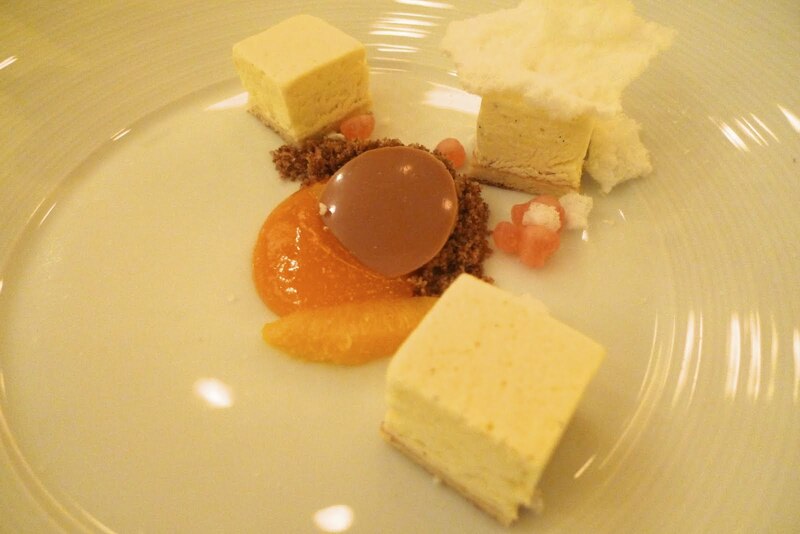 polish off the vanilla parfait dessert. lol. Sorry Gook! You snooze, you lose. I couldn't help myself, it was so texturally interesting and come on, the portions weren't that big. Lucky for him the chocolate dish was placed in front of him so I didn't do quite as much damage. 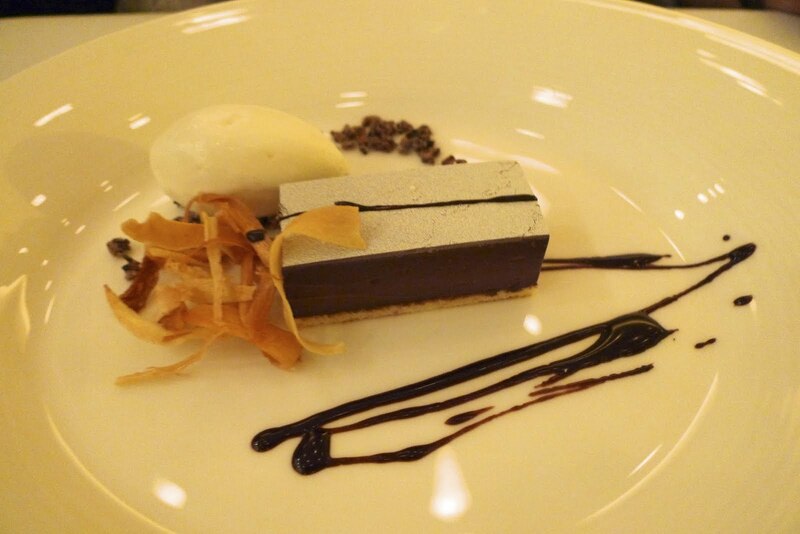 His dessert was chocolate ganache with tahitian vanilla gastrique and parsnip ice cream. 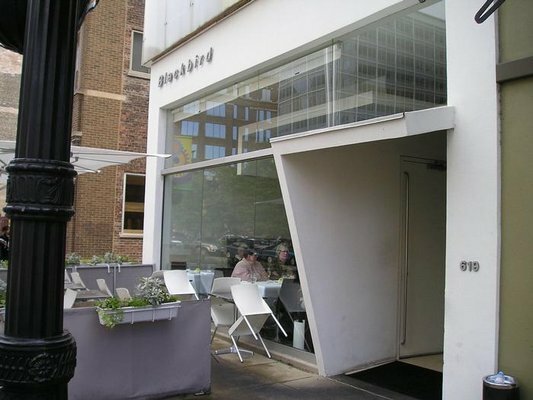 Blackbird is also known for their cocktails list. They had some pretty interesting and tasty drinks. 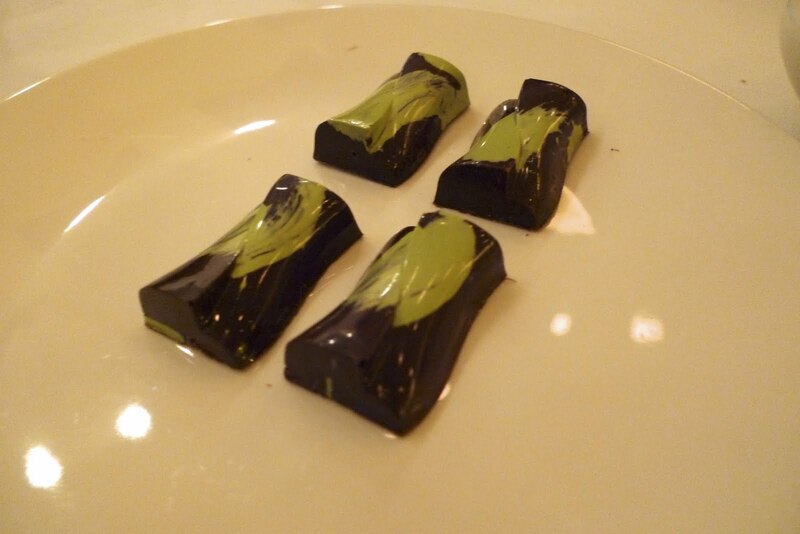 They also gave us green tea chocolates to end our meal. Now that I've tried Blackbird, I must try their sister restaurant, Avec. Both Paul Kahan and Patrick Fahy were nominated for the James Beard award, for Best Outstanding Chef and Outstanding Pastry Chef, respectively. It is totally well deserved. I can't wait to go back.